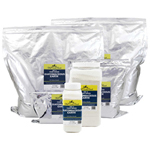 Reptaid is a natural organic antibiotic alternative designed to help reptiles and amphibians overcome viral, bacterial, and microscopic parasitic infections without the complications related to more traditional treatments. Reptaid & Reptaid XL works extremely well for specific and non-specific illnesses. 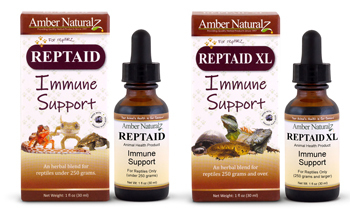 Reptaid is also great to boost and build the immune system of both reptiles and amphibians. Reptaid may also help coloration loss and lack of appetite. 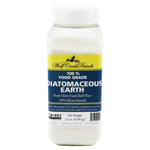 Reptaid contains human grade organic herbs: Olive leaf, Mustard Seed, Black Seed, Pau d'arco, Cloves, Grapefruit Seed Extract (GSE), Jatoba, Alcohol, and Filtered Water. Note: For animals weighing 250 grams or less use Reptaid. For animals weighing more than 250 grams use Reptaid XL. Warning: Keep Reptaid out of reach of children. . Reptaid is to be used only for the care of reptiles. Do not give to animals receiving other antibiotics. Do not give in addition to HWF, Kocci Free, Urinary Tract Relief, Vibactra, Vibactra Plus, or Kennel-Koff. Do not give to gravid (pregnant) reptiles. Do not exceed recommended dose. An overdose can cause miscarriage. Watch for allergic symptoms such as hives, trouble swallowing and swelling around the eyes. If one is experiencing any adverse symptoms or notes any adverse signs, then cease using this product & immediately contact your nearest emergency medical system. Use in the presence of endocrine pancreatic dysfunction (e.g. diabetes mellitus or acute infectious pancreatitis) and evidence of liver disease is a contraindication due to the presence of ethyl alcohol in this product. Alcohol may be removed by protocol (for every drop of product, add 1 drop of hot water and let cool). Under normal circumstances improvement in the reptile's health will be indicated by improved vitality, appetite, color, and attitude. Discontinue use if there is a noticeable decline in general health or any adverse symptoms occur. It is important to weigh your reptile before administration of this product to obtain accurate daily dosing. Continuous use of Reptaid or Reptaid XL without appropriate scheduled interruption is to be avoided, as it is associated with clinically significant listlessness, diarrhea, and vomiting.